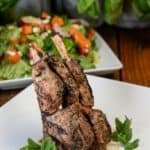 New Zealand grilled lamb chops are mouthwatering and super easy to make. I used a rack of lamb and then marinated them in a quick and easy marinade that was made with mayonnaise, mustard, honey, mint and sirachi. Please note that for best results they should marinate at least 12 hours so plan accordingly. The chops were then simply grilled a few minutes on each side. Lamb from New Zealand is a little bit gamier than American lamb, however they are all grass fed and the meat seems to be more tender than American lamb. When you purchase lamb that is sealed like a vacuum seal, make sure to give the meat plenty of time to breath outside of the packaging before cooking or marinating. Be sure not to over cook the lamb, it should reach a minimum of 140 degrees and should be nice and pink. 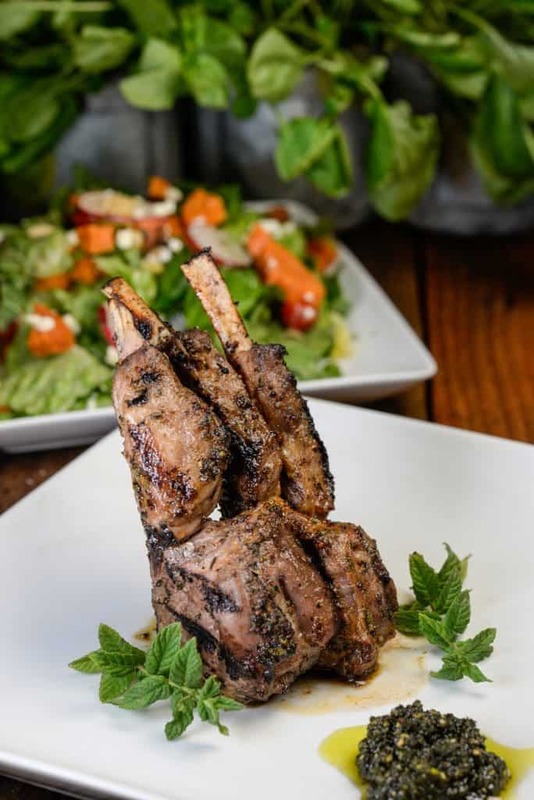 This grilled New Zealand lamb chops are served with a mint-pistachio pesto which is a dip of heaven. Lamb are abundant in New Zealand, I believe they out number people something like 9 to 1 there. Lamb is enjoyed grilled, roasted, pan-seared and often with just a bit of garlic and rosemary. If you think you don’t like lamb, I highly recommend you try it this way, simply delicious! Please note that 12 hour marinade time is not listed in the prep time so please plan accordingly. In a large bowl or tupperware mix all the ingredients together. Add in the chops and make sure they are coated well. For medium they take about 4 minutes a side so pretty quick.